Chantal Hearst: "If he's innocent, why is this taking so long?" Captain Benezet: "I never said he was innocent." Henry Hearst (Gene Hackman) appears to have everything a man could desire out of life. His wife is gorgeous, he has loads of money, and he's well respected in the Puerto Rican community. However, his life may not be as rosy as it appears in the public eye. Two young girls have turned up raped and murdered in the past few weeks, and Hearst is the prime suspect. Captain Victor Benezet (Morgan Freeman) plans to interrogate him until he cracks, even if it takes all night. As the fierce interrogation delves deeper into Hearst's life, we discover the dark and depressing side of this heralded public figure. Based on the Claude Miller's 1981 French thriller Garde a Vue, Under Suspicion focuses primarily on the battle of wills between Benezet and Hearst. Freeman and Hackman chose this film for a chance to dig into a meaty script with numerous one-on-one scenes. It's unfortunate that their collaboration produces only a mediocre result. Both actors (especially Hackman) perform well and dive into the intricacies of the characters. This keeps the film fairly interesting, but it never moves beyond a decent crime drama. Director Stephen Hopkins (The Ghost and the Darkness, Blown Away) injects several innovative stylistic touches that keep the story from becoming too stale. Nearly all of the action takes place inside a few rooms in police headquarters, which could lessen the impact of the story. The best innovation involves the flashback sequences, where the characters asking the questions jump right into the scene. While Hearst wanders through the seedy streets of the city, Benezet follows him and asks about the night in question. He even appears in Hearst's rearview mirror during several automobile scenes. Hopkins definitely has considerable talents behind the camera, but his films generally come off a bit cold and distant. Blown Away contained decent performances from Jeff Bridges and Tommy Lee Jones, an interesting plot, and numerous explosions, but it stands as mere eye candy. While Under Suspicion does contain several human moments, I still felt separated from the action on the screen. The supporting characters in this film fail to measure up with the two imposing leads. Fiery Detective Owens (Thomas Jane) is the opposite of Captain Benezet. His demeanor is brash and condescending, and he lacks the patience for an in-depth interrogation. Unfortunately, his confrontations with Hearst lack the sting and tension necessary to carry the story. Jane (Deep Blue Sea) does what he can with an underwritten role, but his character springs from a bad police movie. Monica Belushi plays Hearst's wife Chantal, and she is one of the most stunning actresses I've seen in recent years. Unfortunately, Belushi failed to totally convince me of her character's feelings toward her husband. It's amazing that a film starring Morgan Freeman and Gene Hackman received such a limited theatrical release in the United States. While the pace of the film is plodding and deliberate, the two wonderful actors would draw their core fans regardless of the story. I wonder if the film's dour and taboo subject matter hindered its chances for a wide release here. When one of the major characters harbors a peculiar obsession with young girls, this is not your typical popcorn movie. Image Transfer Review: Under Suspicion's 1.85:1 widescreen anamorphic transfer succeeds in keeping all of the elements of each frame clear and well defined. The complex flashback sequences often involve characters hovering over each other's shoulders or behind them in the frame. The transfer also contains solid black levels and impressive colors that often correlate with the tone of the action on screen. However, I did notice several defects and a significant amount of grain on the print. Also, several of the outdoor scenes suffered from a lack of brightness. Viewers opposed to widescreen may also watch the film in a cropped full-frame version. Overall, this disc contains a decent transfer that does not hinder the enjoyment of the film. Audio Transfer Review: The 5.1-channel Dolby Digital audio transfer on this disc fails to take full advantage of the rear surround speakers. It works very well in keeping the sharp edges alive in the tense interrogation scenes, but the overall sound experience could have been better. I enjoyed the contrast between the raucous noises of the festival and the quiet, rough interior of the police station. The film's score also works impressively to add to the story's gritty atmosphere. This disc also contains a 2.0-channel Dolby transfer that also emanates a clear and sharp sound. Extras Review: Under Suspicion contains a considerable amount of extras that provide additional insight into this crime drama. The primary supplement is a feature commentary with director Stephen Hopkins and Morgan Freeman. I would hesitate to call this track fascinating, but it does provide a decent amount of insight into the making of the film. Hopkins' track on Lost in Space was one of the highlights of that disc, and he once again offers plenty of information. Freeman is a soft-spoken man, but his comments are thoughtful and worthwhile. This disc also includes an 11-minute promotional featurette that primarily contains interviews with Morgan Freeman and Gene Hackman. Most of their comments fall into the light promotional category, but it's interesting to see both stars showing a genuine excitement for the project. The short featurette also has scenes from the film and comments from Hopkins and the supporting cast. A full-screen theatrical trailer and talent files round out the extra features. The trailer gives away a little too much of the plot, which is an unfortunate common occurrence today. The talent files provide the basic background and selected filmography for Hopkins, writer W. Peter Iliff (Varsity Blues, Patriot Games), and the primary cast members. 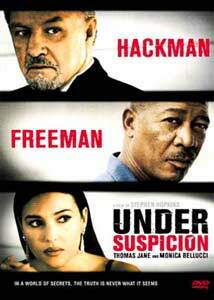 Under Suspicion's dream combination of two wonderful actors within a play-like atmosphere would appear to be the perfect setting for a classic crime thriller. However, it's tone ultimately lacked the level of personal intensity necessary to draw me into the picture. The story is interesting, but it never reaches the level of compelling drama.